DJs Al Mackenzie (Great Outdoors, D:Ream) and Slugrave on the Multi-sensory dancefloor with glitter cannons, bubbles and giant parachute dance. For families with younger children (0-8 years old) though older siblings are welcome. Adults are not admitted unless accompanied by a child. A max of 3 children per adult. 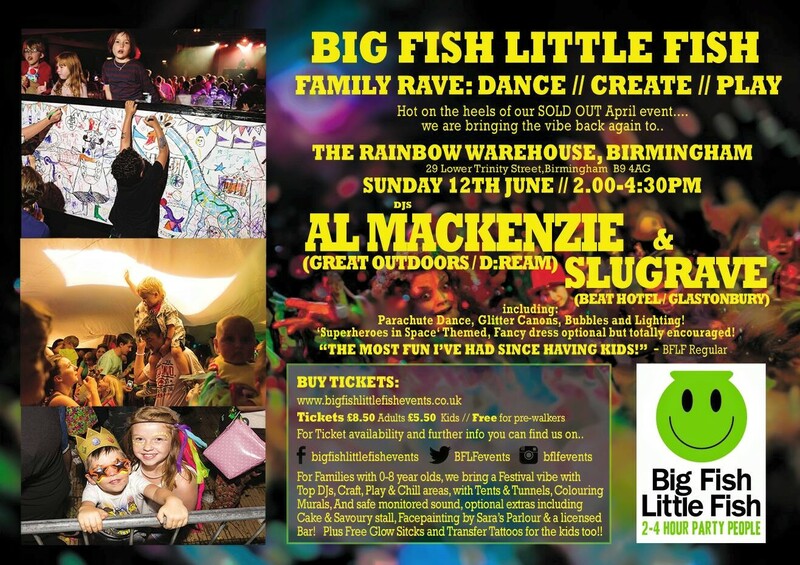 A max of 4 adults per child (and such groups must be pre-approved by emailing anna@bigfishlittlefishevents.co.uk before buying tickets). Tickets are non-refundable but if anybody with tickets finds they cannot attend a sold-out event please email anna@bigfishlittlefishevents.co.uk and I will attempt to put you in touch with people seeking to buy tickets. Each member of your group must have a ticket, adults £8.50, child £5.50 and pre-walking infants free (but ticketed). Will cost more on the door (if tickets available).